Agent Kaitlin Reporting for Duty for Sassy’s Fangirl Debuts! - Next Page Please! 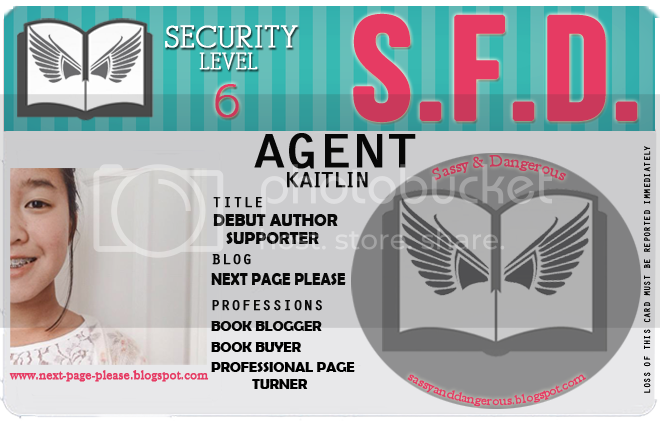 Agent Kaitlin Reporting for Duty for Sassy’s Fangirl Debuts! Although there was a slight delay due to a giant, angry green problem, (TOP SECRET clearance needed for more details!) everything is now back on course. With the help of a few other agents, our plans are finally being launched. Sassy’s Fangirl Debuts (S.F.D. for short) is a fun, unique way in helping readers to keep track of all the debut authors and their new books that are coming out, and it is also a way for authors to promote their books and get readers interested. The feature, which Agent T has decided to make it into a debut author street team, will include author interrogations, (interviews), confidential file exposures (guest posts) and the radioactive surprises (giveaways) which will all be posted on her blog, Sassy & Dangerous. Agent T's highly skilled team of agents will be going on special missions that will include fun, awesome posts to feature these lovely debut authors and their books. Tomorrow will be the agents first mission, so don't forget to stop by Next Page Please! tomorrow and to also check out the list of rest of the agents blogs below!